Inspections revealed that the concrete walls and floor were in a poor condition and was leaking water. This leakage was causing problems with the pool paint system which required on-going maintenance. 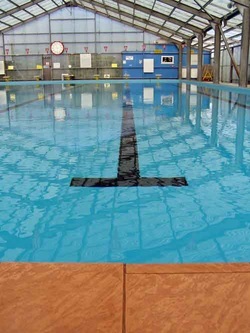 to extend the life of the existing pool in the interim. October 2006 and the new pool was opened in April 2009.
and showed no sign of failure. I have no doubt that the liner would have lasted for a many years and proved to be an excellent solution.